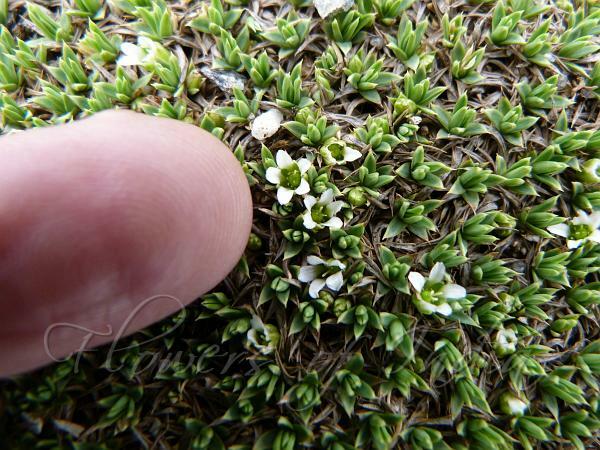 Hummock Sandwort is a high altitude plant forming hemispherical hummocks (small mounds or cushions) of dense moss-like leaves 2- 3mm long and a lustrous bright green. Flowers are minute, white, sitting tight on the hummock. Sepals are 5, ovate, ovate-elliptic, or broadly elliptic, about 3 mm, base broadened, apex blunt. Petals 5, white, ovate or broadly obovate, slightly longer than sepals. Floral disc patellate, with 5 dark glands. Stamens 10, filaments about 1.5 mm, anthers yellow. 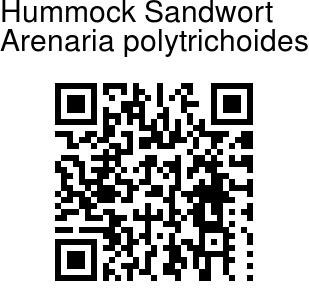 Hummock Sandwort is found in the Himalayas, from Ladakh to south-eastern Tibet and NE India, on stony slopes and amongst rocks at altitudes of 3500-5300 m. Flowering: June-July. Photographed at Bumla Pass, Arunachal Pradesh.